Ford and Lear Corporation have introduced a new head restraint foam with 25% of the polyol replaced with soy. Henry Ford was a strong advocate of using soy back in the early 1900s. In fact, he believed "someday auto bodies will be grown down on the farm." Henry Ford's vision is coming pass. "In 2004 Ford received a grant from the United Soybean board to develop products using soy," explains Angela Harris, Ford plastic research engineer. "Ford pioneered the use of soy-based foam in seats in the 2008 Mustang and in headliners in the 2010 Ford Escape and Mercury Mariner. Ford and Lear are now taking another leap forward in sustainable technology with the introduction of a new head restraint that is 25% soy." 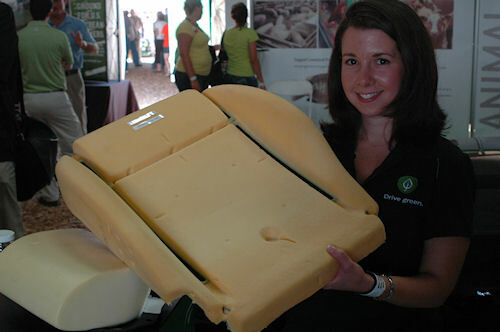 Angela Harris, Ford plastic research engineer, holds a seat cushion next to a head restraint, both made with SoyFoam. The announcement was made Wednesday at the Farm Progress Show during a press conference in the Illinois Soybean Association exhibit. "As a soybean grower, I'm excited about the effort Ford is putting into soy based products," says Matt Hughes, ISA chairman. Seventy-five percent of Ford's North American Vehicles feature bio-foam in the head restraints, including the Ford F-150, Taurus, Explorer and Fusion. All Ford Motor Company vehicles built in North America use bio-foam content in the seat cushions and backs. "We are continuously looking for new ways to expand our use of bio-based foam, and head restraints are a perfect example," says Debbie Mielewsiki, technical leader, Ford Plastics Research. "It's a new location with higher soy content. We're not stopping at head restraints, either. There are still many applications in which traditional foam can be converted to bio-based soy foam on vehicles, such as energy-absorption areas, steering wheels and armrests." Ford uses 3 million pounds of soy each year in seat backs, cushions and headrests, according to Harris. The extended use of soy foam results from the continued research collaboration between Ford and Lear. The collaboration generated the recent complete conversion of all Lear North American Ford seating cushion foam to Lear SoyFoam. SoyFoam is up to 24% more renewable than petroleum-based foam. Use of SoyFoam has helped Ford reduce its car bon dioxide emissions by more than15 million pounds. SoyForam also can provide a 67% reduction in volatile organic compound emissions, according to Ford. Harris also notes Ford is doing research with corn and wheat straw for potential uses in plastic products.